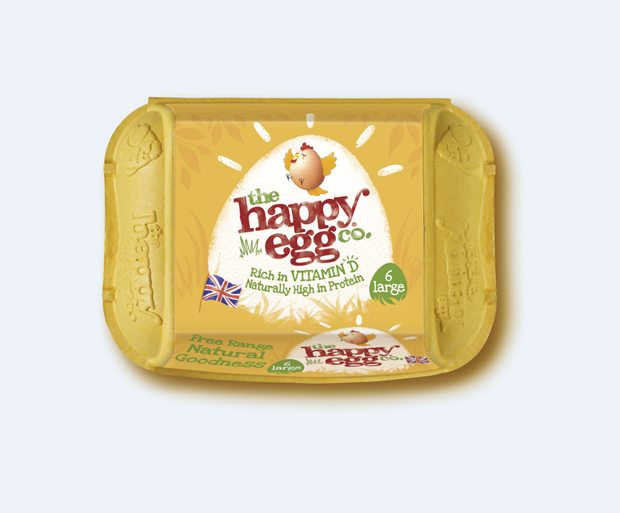 the happy egg co. – the no.1 UK free range egg brand – is transforming its entire range to offer eggs much richer in Vitamin D, as part of a major new brand refresh. Hitting shelves from the middle of September, the range will feature an updated packaging design which showcases the new Vitamin D credentials, as well as the brand’s new proposition – ‘full of natural tasty goodness’. The market leader has sold 323 million Happy Eggs in the past year, a brand which has demonstrated +15% value growth, outperforming both the market and the total Free Range category. With 60% of total Free Range growth driven from the happy egg co, the brand is already bought by 5.9 million households and is perfectly placed to launch this initiative. In the UK it is estimated that 1 in 5 adults are vitamin D deficient4. Vitamin D is essential for the regulation of calcium and phosphorus balance in the body4 and also helps the immune system. The new happy egg co. proposition helps consumers increase their dietary vitamin D intake by offering a range which contains 28% more Vitamin D per 100g than standard eggs. With more people buying and eating eggs than ever before, the happy egg co. continues to meet consumers’ ongoing need for healthy, nutritious, versatile, and tasty food with this latest launch. Eating two large happy eggs a day will now give consumers 95% of their recommended Vitamin D intake. Stuart Agnew, Category & Marketing Director at Noble Foods, comments: “the happy egg co. paved the way for Free Range eggs when the trend towards welfare awareness and conscience emerged. During the process of ensuring that our hens get the nutrients they need, we added Vitamin D to their diet for their own health and wellbeing. Working with Newcastle University, Innovate UK and DSM, we later discovered that this Vitamin D is rapidly absorbed by the hen and passed on to their eggs. Eggs are one of very few foods in our daily diet which naturally contain Vitamin D so we are really excited to be able to pass even more of this fantastic health benefit on to consumers so that they can eat and live better, powered by the natural tasty goodness of Happy Eggs. “We are confident that this unique innovation which meets consumers’ needs whilst staying true to our welfare credentials, will encourage shoppers to trade up and drive further growth of the category”. The new range will land on shelves from mid-September and will be supported by major marketing investment around the new “full of natural tasty goodness” proposition, including a heavyweight digital campaign and exclusive partnerships with Park Run and the National Schools Partnership. More information on the happy egg co. is available at www.thehappyegg.co.uk.